Townend, Paul. "Air Canada Award". The Canadian Encyclopedia, 30 June 2016, Historica Canada. https://www.thecanadianencyclopedia.ca/en/article/air-canada-award. Accessed 19 April 2019. 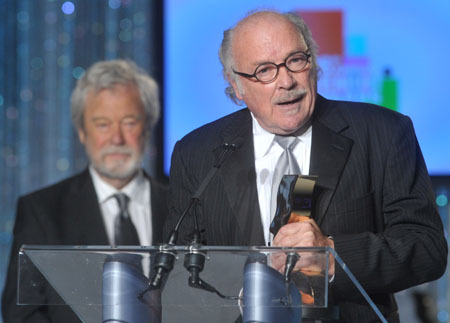 The Air Canada Award, presented at the annual Genie Awards from 1980 to 1994, was given for "outstanding contributions to the business of filmmaking in Canada." Winners are listed by the year the award was presented. 1980 — George Destounis, president of Famous Players Ltd.
1989 — Kodak Canada Inc.
1990 — Harold Greenberg, producer and CEO of Astral Bellevue Pathé Inc.